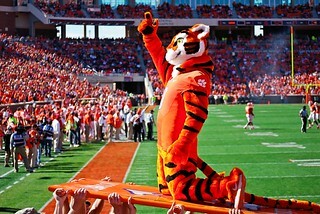 CLEMSON- Last week was fun in the Georgia Dome, but there’s no place like home. In 2011, the Clemson Tigers were a perfect 7-0 in the friendly confines of Death Valley before going on the road for five straight games dating back to the NC State game in early November. As fans, we can’t wait to see the Tigers run down the hill, the Clemson band’s pregame performance and tailgate with 80,000 of our closest friends. Quarterback Tajh Boyd said it best this week when he said that Death Valley is the Tigers’ haven and Clemson must win at home. "This is home for us,” Boyd said Tuesday. “This is our haven. You are not going to come into somebody's house, take the remote and start flipping through the channels. So for us, it is just you have to win at home. You have to win at home. You have to take advantage of the situations. We don't want anyone to disrespect us at our house." The Tigers will open up play in Memorial Stadium against Ball State, which beat Eastern Michigan 37-26 in the season opener last week. Ball State head coach Pete Lembo runs a spread offense that orchestrates long, grueling drives and takes large chunks of time off the clock. Quarterback Keith Wenning is battle-tested and has played in some of the toughest environments in college football- starting at Oklahoma a year ago. Wenning was 26-for-41 for 267 yards last week. The Cardinals have a home-run threat in running back Jahwan Edwards, who rushed for 200 yards and three touchdowns against Eastern Michigan. The good news for Ball St. is that their strengths of spreading the ball around and having a mobile quarterback play to the weaknesses of Clemson’s defense. The linebackers and defensive line will have to make more plays this week and tackle better if they hope to contain the explosive Cardinal offense. Against Auburn, there were too many missed tackles that allowed the running back to get to the second level forcing the Clemson secondary to save the day. Ball St. hasn’t faced an offense that has as much speed as Clemson and probably won’t face another one. Andre Ellington proved last week that when he is healthy he is as dangerous as any running back in the country. Just ask Auburn - he torched that SEC defense for a career-high 228 yards.Boyd had- in my opinion- one of the best games of his young career. He showed the growth that he has made over the course of a year by using his legs to keep plays alive and checking down to receivers when the big play wasn’t open. At the receiver spot, not many people have a Nuk Hopkins, a Martavis Bryant and a Charone Peake that can line up at one time. Ball St. will try to use the same defensive scheme that Auburn did to avoid the big play, but it is unlikely that they have the speed to keep up with all of Clemson’s talent at the skill positions. Tajh’s Helmet: The NCAA implemented a new helmet rule for this season- if a player’s helmet comes off-unless as a result of a penalty- that player must sit out the next play. Clemson became very familiar with new rule when Boyd’s helmet came off –or was ripped off- three times forcing backup quarterback Cole Stoudt into the game. The Clemson equipment staff changed the type of helmet Boyd will be wearing, so hopefully that will alleviate his helmet issues from the Auburn game. Penalties: The Clemson offense was called for seven penalties in the game, which is a record under offensive coordinator Chad Morris. The offense was flagged for two illegal shift penalties that negated big plays, and numerous false starts. The good news, however, is after being called for six penalties in the first half the offense settled down and wasn’t penalized again until late in the fourth quarter. The penalties have to be kept to a minimum to keep drives from stalling and to help the offense take advantage of scoring opportunities. Dropped Passes: The Clemson tight ends dropped three passes and allowed an Auburn defender to take the ball away for an interception. The Clemson offense definitely missed former tight end Dwayne Allen, who is now playing in the NFL for the Indianapolis Colts. Morris said after the Auburn game that the only way to fix the dropped passes was to keep throwing to the tight ends, so expect a large dose of passes to the tight ends this weekend against Ball St.
Ball St. racked up over 500 yards of offense in the opening week, and I expect them to move the ball against Clemson- but just like last week the Tiger defense will hold in crunch time and prevent the Cardinals from scoring a ton of points. On offense, Clemson has proven that they can be slow out of the gate, but they will pull away in the third quarter to allow some of the younger guys to gain some much-needed game experience. And, if the game comes down to special teams, my bet is on Tiger placekicker Chandler Catanzaro who has been money hitting all four of his attempts last week.